"This way of turning compression into (charge) acceleration is hypothesized to be the core wave mechanism of phase conjugation (apparent self-organization) and the centripetal forces of gravity, life force, color, and perception." 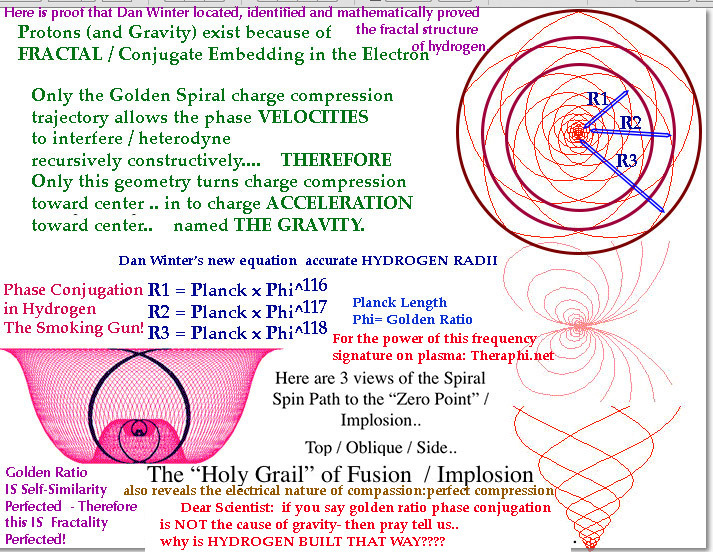 (Dan Winter's new equation for 3 significant hydrogen radii - planck length * integer exponents golden ratio- goldenmean.info/goldenproof -beautifully complements extensive work by Heyrovska et al - on golden ratio wave mechanics in hydrogen structure- see link above. 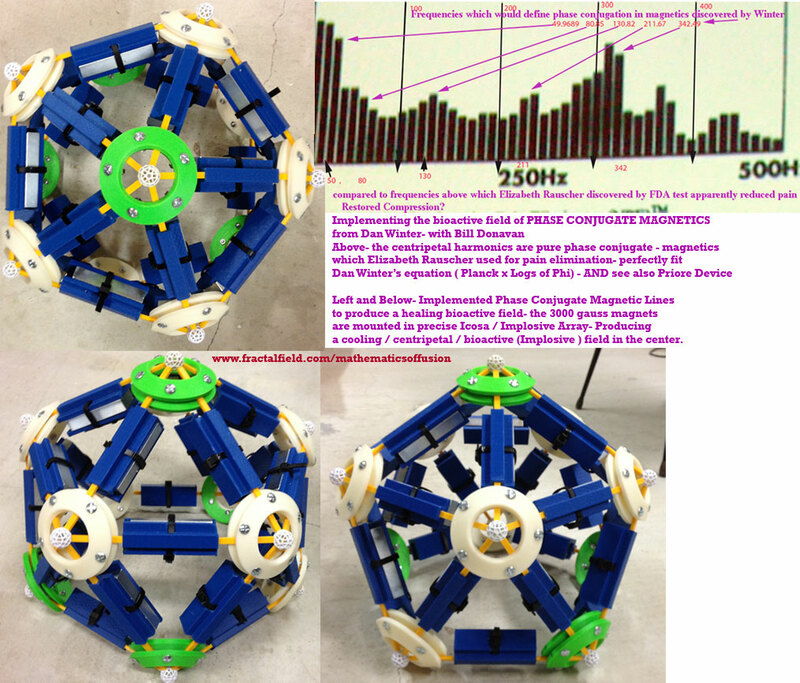 Breakthru's in Zero Point Energy Research with Phase Conjugates / Implosion- The Latest! 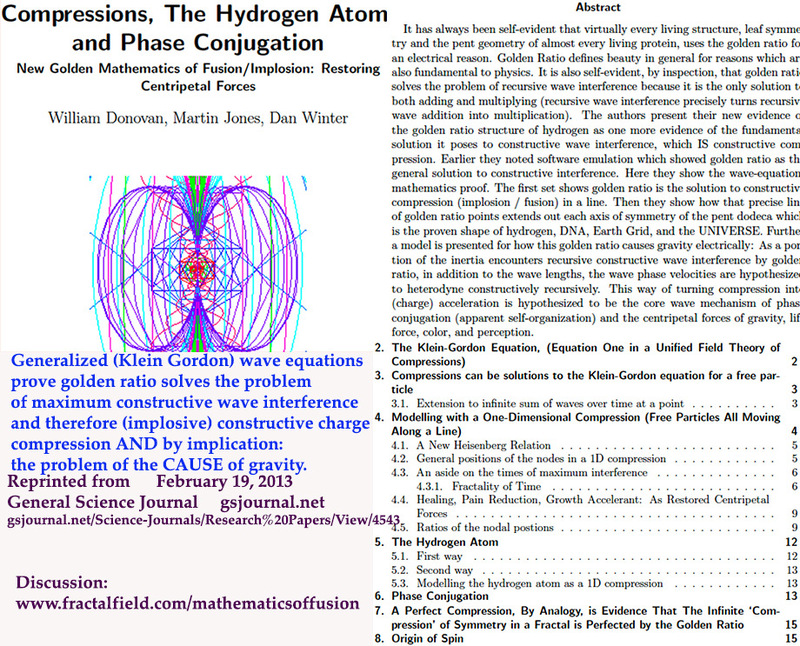 *Dan Winter's extended new equation for the structure of the hydrogen atom: goldenmean.info/goldenproof - Planck Length x precise exponents of golden ratio= multiple hydrogen radii, shown in this article to be the precise wave mechanism of golden ratio implosive collapse / phase conjugation / fusion - would account for why 'fractal' hydrogen is the central bond of water, the 'zipper' ensouling DNA codon center bond, and solar fusion. but like the ball lightning -self organization- (depicted also there)- is itself a profoundly healing and bioactive field! 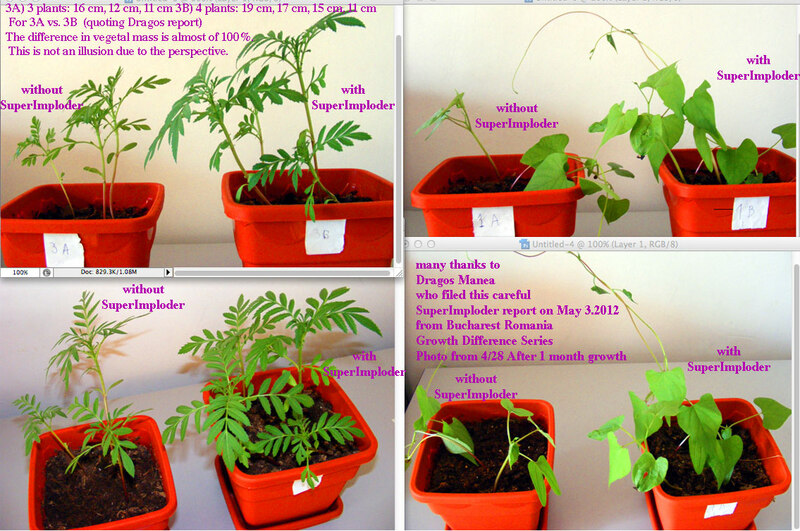 We hypothesize: LIFE FORCE in plants REQUIRES implosive charge compression from ELECTRICAL fractality. This is the IN-PHI-KNIT Connectedness (Collective Mind/Communion of Saints) Golden Ratio Principle at the core of DNA.. Entry upon test for PURE INTENTION.. The Perfectly SHAREABLE Wave! 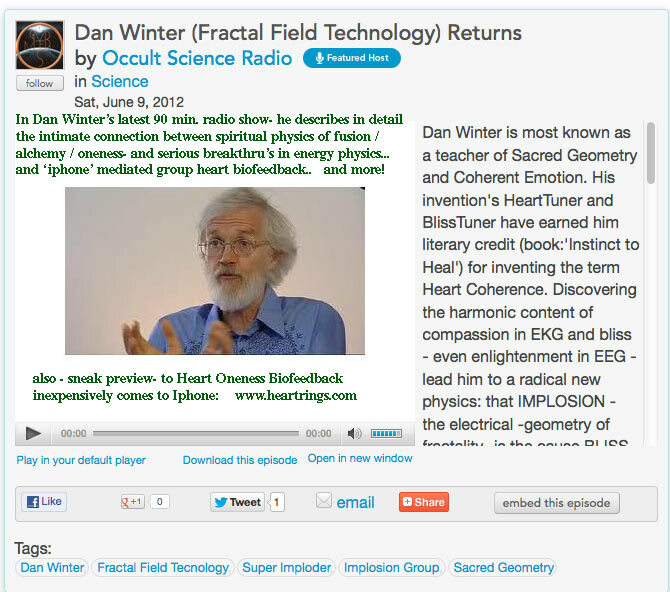 - See measured How (Heart) Coherence Perfected is Fractal. and in the process the origin of all centripetal forces- including gravity? 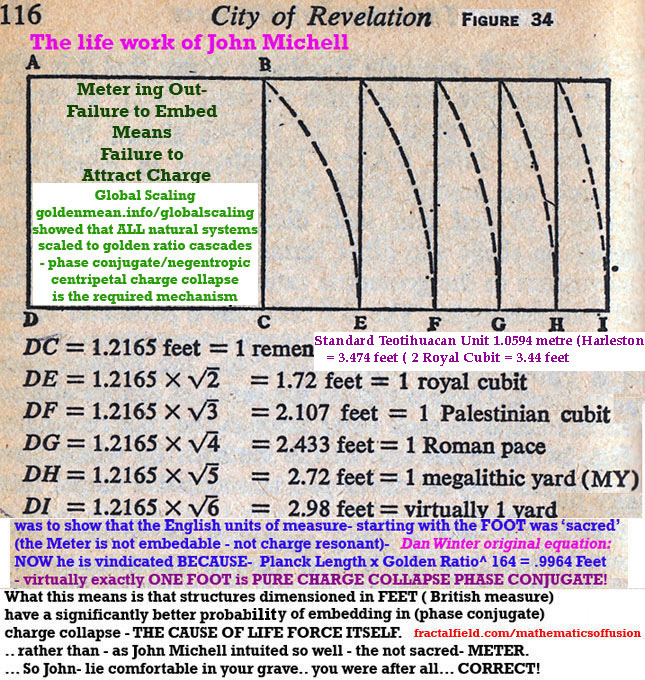 (charge distribution perfected wave mechanics/ perfected EMBEDDING - IS Life and mind).. The key to (phase conjugate) cohering the energy of the vacuum..
is the understanding that the only way the inertia is stored and distributed IN the vacuum.. SO to COHERE THE ENERGY of the Vacuum- to reach into the vacuum and extract the (charge) inertia- the symmetry of your (phase conjugate) array (optical/ dielectric / magnetic / phonon)..
MUST invite that implosion of inertia into the perfect cone - BY BEING AS FRACTAL / CONJUGATE as the inertia of the vacuum is itself! 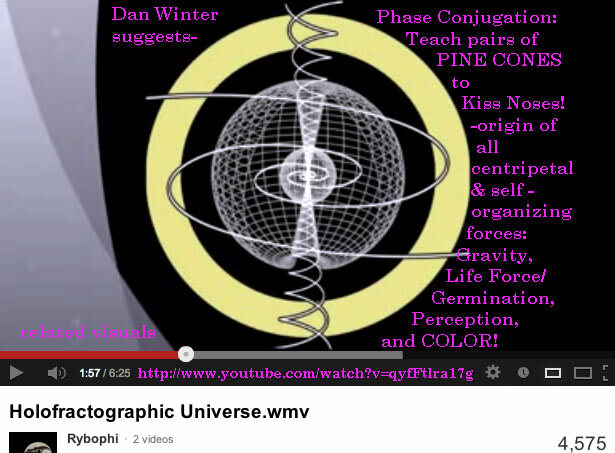 "Phase conjugation: when pairs of pine cones learn to kiss noses"
as we say - it is "the only way for pine cones to kiss noses". - phase conjugate optics, dielectrics AND (now we see examples of) magnetics! how John McGovern- discovered how the origin of all SHAMAN ALPHABETS- petro-glyphs are generally PLASMA RESIDUE- with a universal translation. He started after finding Hebrew on Australian Aboriginal cave petroglyphs - finding that he could essentially read any rock petroglyph carved by a shaman anywhere in the world - based only on PLASMA RESIDUE symmetry. Note how - now this has been embraced by TONY PERATT- Los Alamos PLASMA PHYSICS- who now publish this work. A shadow of a plasma residue / phosphene flare / or spiral on the donut IS alphabet - because putting these in symmetry (sequence) called ALPHABET- is how you MAKE the plasma of your mind implosive and charge compressing (golem making) - which IS (the only definition of ) consciousness! Because the centripetal plasma force this creates in your aura- is the cause and mechanism of consciousness. that symmetry- initiates the cone implosion compression (of charge) which is the cause and definition of how consciousness is created by the plasma bending hemispheres of the brain! Remember this self organizing golden spiral mapped on the self organizing torus donut domain- is not changing shape- only your point of view. Consume the perspective- e pluribus unum- from many: one- leap out of flatland - get up off your cross- and follow me - to symbolize IS to embed.. The pure self organizing symmetry of charge / light - is the only alphabet which ever was immortal OR psychokinetic. 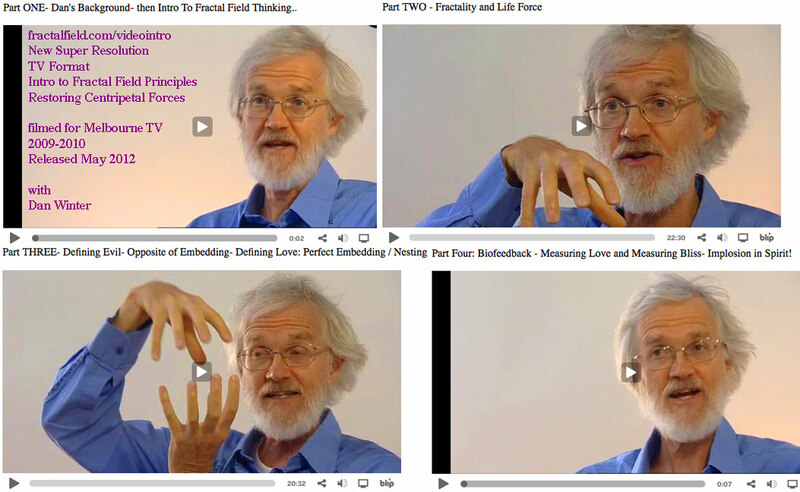 The 'point' is.. as Stanford physicist Bill Tiller ("Conscious Acts of Creation") book proved unmistakeably - FOCUSED HUMAN ATTENTION CAUSES ELECTRIC FIELDS TO COMPRESS!- Dan Winter shows how properly used- the alphabet allows the mind- to trigger charge compression (golden spiral- on toroid field)- in symmetry sequence (alphabet) - to create the phenomenon of MINDFULNESS- which is literally (electrically) - a (golden spiral based) FOCUSing device- for charge. That implosion of focus (electric charge) being at once - the origin of MIND- / consciousness- AND the very (electrically centripetal) NATURE of LIFE FORCE ( see 3 ways to measure life force- as architecture of life- at goldenmean.info/architecture ). Using the alphabet correctly - we set the plasma field of the optical cortex (visual image field) - into the correct sequence of implosive donut (toroid) fields- to do exactly what physics knows is creation mechanics - in the mind (sequence field effects into the symmetry which makes them centripetal - golden ratio- AND nest in -tetra/cubic- arrays). and therefore of the perfected charge distribution causing life and mind.. 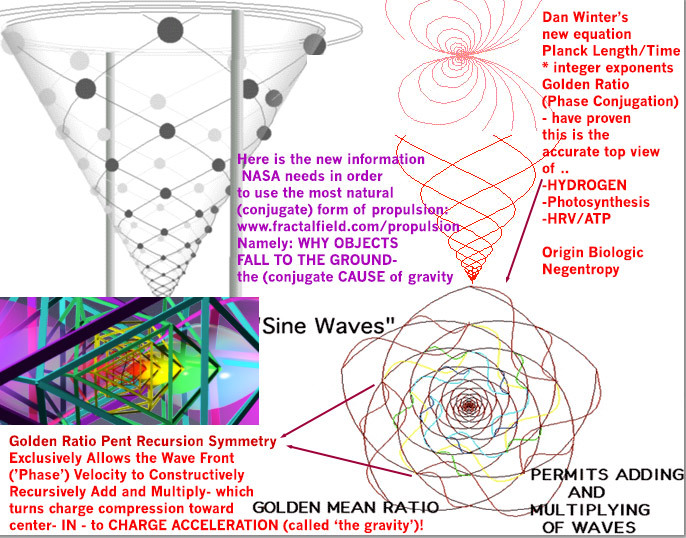 Note how our SUPERIMPLODER- APPLIES the EXACT 10 spiral cone geometry - scaled precisely- to new hydrogen fusion physics..
A.4 Dark Matter – Or is it Phase Conjugate Matter? An can be determined by normalizing Ψ. The solutions to this equation are the golden ratio. This is evidence (‘proof’) for golden ratio maximizing constructive interference at the point (0, 0). Therefore, at times tn = nπ ϕnωo, an infinite sum of waves with frequencies that have relative ratios of powers of the golden ratio have maximum values and therefore interfere constructively. We have designed a compression of wave states that firstly, solves the Klein-Gordon equation for a free particle, and secondly, is optimized for maximum constructive interference at precise times and positions. It is found for a particular set of coefficients that when the frequencies of the individual wave-states are related by ratio to powers of a number, that maximizing number for maximum constructive interference at well-defined positions and times of the compression is phi, or the Golden Ratio. This means that an infinite number of states of a single, or multiple free particle/s is/are compressed maximally when the ratio between wave-state frequencies is a power of the Golden Proportion. The coefficients chosen to discover this possible scenario of maximum compression must be a set that is of great importance and must be studied. The sum of squares of the coefficients equal 1, and this is so to make the compression normalized to unity. Note the peaks of constructive interference. We show later that the ratios between the distance from the origin of any two peaks in a one dimensional perfected compression is approximately powers of Golden Ratio. Compressions are unique because they embody the idea that ‘the whole is greater than the sum of its parts’. We have found that there are ‘nodes’ of maximum interference of the individual wave-states, where the nodes can be interpreted as quasi-particles or centers of particle systems. Subsequently, the node numbers correspond to the quantum number of the ordered wave-state in the compression, where node number n corresponds to a frequency of ϕnω o of wave-state n. Also, modelling with compressions makes some assumptions about the system being modeled, one of them being that momenta of the constituent waves do not depend on ϕ, while the frequency does. This may be remedied by the knowledge that ϕ is inherently a constant, and in previous derivations showing the Golden Proportion as the maximizing ratio for perfected compressions, it was treated as a variable in order to prove maximum constructive interference at specific times (we will soon show the positions in what follows). That mathematical trick to show maximum interference may be just that: a trick, and our assumption about the momenta of the system is not necessary. So, the position and momentum of each node at the times of maximizing interference considered at the origin are thusly derived. We will now derive formulae for the positions and times of the nodes of maximum interference in a 1D compression. To start, we define two points, xn and xq that both obey Equation 10, and xq alone obeys Equation 11. For now consider the two points as different from one another. We shall later derive equations for these two points that hold for all nodes in the compression. So there are quantized times that maximum interference occurs at the nodes with quantum time number q. Also, Equation 12 is equal to Equation 13 when node number n is equal to quantum time number q. So the most interesting result is Equation 12 that depends on both time and node quantum numbers because it gives the positions of every node in the compression at the particular times of maximum interference, hence perfect compression. An analysis of Equation 14 shows that for all positive time quantum numbers q there is a maximum time during which all possible maximum interference at the nodes occur. This fact implies that processes that are modelled with 1D compressions are only perfected within a finite lifespan. This gives a lifetime of those processes at tmax = 2π ϕ2ωo. A notable consequence of this formula is that the lifetime of processes only depend on π, ϕ, and ωo which we are interpreting as the characteristic frequency of the system. We understand that while space is quantized like the grain structure of the quantum foam by the planck length, that time is quantized by the planck time. This means essentially that every wave that physics has ever measured fits evenly into these units. (We would also hypothesize that physics has never measured anything but waves). For our way of conceiving this wave mechanism of quantum function, it seems that the compressibility of the quantum foam or vacuum (‘ether’) behaves like a fluid in which the wave propagation stores inertia when it rotates; that inertia then becomes our (only?) definition of mass. It is also likely that we could describe the compression and rarefaction within this compressible ‘liquid’ media as the (only?) definition / origin of plus and minus charge. Further, then the rotation of these waves of charge then originates the concept of the period of this spin, which becomes our (only?) definition of time. Further, we hypothesize in this paper how constructive interference optimized by golden ratio, then is the origin of spin in general (shown later). So, the very existence of vorticity, wormholes, strings, and the toroid tornados in this ‘fluid’ is due to wave interference optimized toward non-destructive interference (PERFECTED compressions) by the recursion-perfected, non-destructive self re-entry called the golden mean spiral. In hydrodynamics, it then makes sense that this spiral is called optimized translation of vorticity because this corrected path from linear inertia (energy) to rotational inertia (mass) becomes effectively the only self-organizing path from energy to mass. Note how later, after we measured golden ratio in brainwaves correlating to peak perception, (http://goldenmean.info/clinicalintro), it makes sense to define this phase conjugation by golden ratio as the origin of perception. Ability to self-reenter (‘know thyself’) does appear to be the charge wave mechanic of consciousness (“with turning inside-out ness”). This also then accounts for how focused human attention so measureably causes charge fields to compress (Bill Tiller), and radioactivity to be reduced (Uri Geller- measurements not confirmed). We wish to properly introduce the mathematics of fractality in time. IF we are correct then coincidence is optimized by charge rotations which phase conjugate (become fractal) and thus, exchange charge rotation inertia in both space and time. This would predict both when and where coincidence is more possible. And would explain as Bruce Cathie showed that even the critical mass of nuclear reactions depends on correct placement in the (fractal / phase conjugate ) grid of space and time. We note how significant it is that time reversal in phase conjugate optics for example can ONLY return a wave system to its previous state time IF that wave state is more ordered. Here we would say that the state of order of wave systems climaxes or reaches its greatest coherence in the state of phase conjugation. This model of phase conjugation producing time ‘travel’ (moving between nodes of great conjugate coherence) further predicts that the time connection (phase conjugate charge rotation coupled) always requires wave phase velocities that are superluminal / faster than light- by GOLDEN RATIO MULTIPLES TIMES THE SPEED OF LIGHT. This hypothesis arises out of the model of gravity implied, which requires that gravity originates because the charge waves add and multiply constructively their phase velocities using golden ratio, producing acceleration of charge (gravity) when the compression of charge is golden ratio (as we show here is the essential structure of hydrogen and hydrogen fusion). So further this hypothesis suggests that gravity cannot originate or exist except when charge waves meet in golden ratio symmetry. 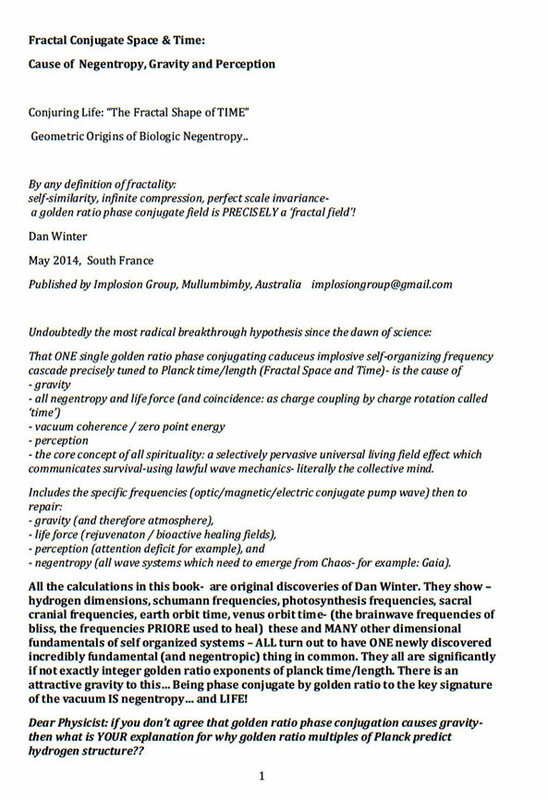 Note how clearly the literature confirms that not only hydrogen, but DNA, Earth Grid, and the Universe are essential penta-, dodeca- symmetry precisely because the dodeca- stellation produces infinite nodes where every vertex is only a golden ratio exponent distance from center. (http://goldenmean.info/selforganization). We have made the point graphically (http://goldenmean.info/creation) that then gravity seems to only exist in atoms to the extent that their inside (nucleus) is self similar or ’fractal’ to their outside (electrons). There you see how the ‘platonic’ symmetry distribution of the nuclear hadrons does appear to mirror the same ‘platonic’ distribution of electrons. After Winter discovered that whole number exponents of planck length modelled the hydrogen radii with amazing accuracy, he explored the correlating frequency signature for hydrogen. Also, it has been posited that a multiplication operation between two compressions could model aspects of spin of a system because two fractal (or vector) numbers multiplied produce an axial vector number which is spin. Winter has also posited that time can only be defined through charge rotation. So, by extension, we say that one compression perfected by Golden Ratio operating on another compression perfected by Golden Ratio leads to a model of spinning charge. With Winter’s supposition about the nature of time, we then say that if charged particles can be modelled as perfect compressions, then time also has a fractal representation through the two compressions. Two phase conjugated compressions should lead to negative time, a phase conjugated compression operated on a regular compression should give new physics. The reason containers made of biologic materials cause growth versus containers made of (non-phase conjugate) steel and aluminum (buildings) effectively make capacitance poisonous to every living thing. As we explain in our architecure curriculum this is measureable as the same harmonic inclusiveness (charge breathing made efficient) in Heart Rate Variability, which medical doctors use to measure whether you have an immune system (discussion: http://goldenmean.info/holarchy), or not. So, embedability optimized by this golden ratio phase conjugation seems to define the wave system of all life and mind and self-organization and coincidence because this is the only way centripetal wave forces like gravity, life, mind, and perception originate. 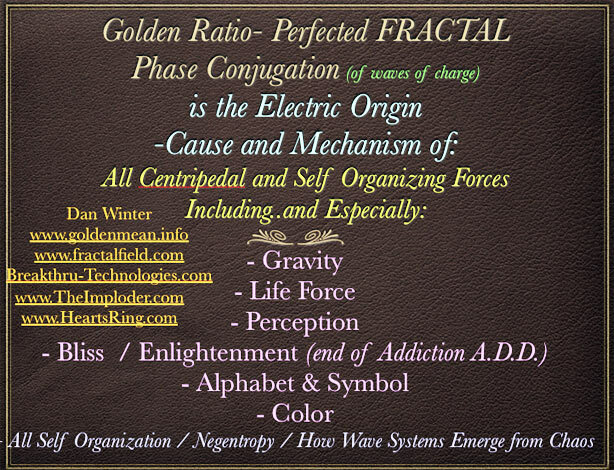 A further implication is that since all self-organization requires this centripetal phase conjugate field symmetry, as well as growth acceleration, there will be healing and pain reduction produced by such centripetal fields. Priure produced phase conjugate fields which eliminated cancer. Tom Bearden describes this (http://goldenmean.info/phaseconjugate). Extending the principle we see why Elizabeth Rauscher’s magnetic harmonics (below) produced documented pain reduction, AND healing acceleration. Winter later coined the term PHASE CONJUGATE MAGNETICS for this centripetal magnetic principle (which Elizabeth appeared to embrace) when he discovered that the magnetic frequencies she used later turned out to largely fit his equation for phase conjugation (planck time multipled by exact golden ratio exponents). For large values of n and m, this ratio approximates simply to powers of the Golden Proportion. This can be shown with a model of the hydrogen atom, taken as a compression or distribution of free, compressed waves. We will introduce such a model further in the section on the hydrogen atom. In the penta-, dodeca-/icosa- symmetry, we can see how the “concrescence” of waves, can produce centering of constructive pressure agreement producing the possibility of converging a virtually infinite number of nesting spin symmetries. This is nature’s tactic of PERFECT embedding. Not only does it have everything to do with magnetism ONE WAY WIND of inward implosion called gravity, it also is probably the essential geometry of COMPASSION itself. Our paper shows the mathematical evidence that Golden Ratio in one line (linear, one dimension) perfects compression. We present here that what we have shown mathematically as the solution to compression in one dimension IS the solution in 3 dimensions (and more) because in the dodeca-/icosa-/dodeca- infinite nest, EACH vertex x,y,z coordinate is a simple whole exponent of golden ratio, meaning (as our top animation shows) the distance to center in this nodal array - from every node infinitely is a simple multiple of golden ratio (wave compression). 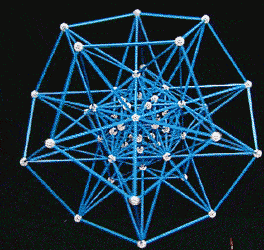 Quoting further from “One Crystal’s Dance” by Dan Winter - (in his 20’s): “Note how simple it is to continue infinitely.. - simply extend every icosahedron edge length straight out by ratio Golden Mean, to make another Dodeca, then extend that dodeca edge straight out again by Golden Ratio longer to make another icosa etc. Alternating (interdigitating) infinitely. Each succeeding dodeca or icosa can be plotted digitally by simply multiplying by Golden Mean squared (2.618) to the vertex coordinates of the previous! We know from work done by Winter that at least three hydrogen orbital radii can be calculated from the planck length multiplied by integer powers of phi, ϕ, the Golden Ratio. Here we write these three radii as hlϕ115+n from n = 1, 2, 3 and derive some formulas for writing the probability density of the hydrogen state: |ψn00|2. All that is needed is to find the appropriate Xn that meet the criteria outlined above in Equation 17, preferably something that resembles the radial hydrogen equations. Equation 16 is a definition that leads to an approximation of the hydrogen atom solution of the Shroedinger equation that has exact average radii equal to Winter’s results, so that the form of Xn is not critical due to the theorems (i.e. Variational Theorem) already proven for ground state approximations of the wavefunction. where En is the well known energy of the electron in the hydrogen atom at each orbital, numbered by n. Thus we obtain an approximation equation for the energy of the hydrogen atom in terms of our function, Xn, and Winter’s orbital radii. If the wavefunctions thus obtained are normalized to unity, then Equation 7 would simply be En. But because we have derived conditions for an approximate result, it may not be as simple as to assume that H̄ψn00 = Enψn00 for our approximation (where En is the known value mentioned previously), so that Equation 21 remains only a mathematical exercise. To obtain the appropriate approximation, we must begin at Equation 6. The energy eigenvalues for the approximate eigenfunctions we have derived will most likely be different from En. 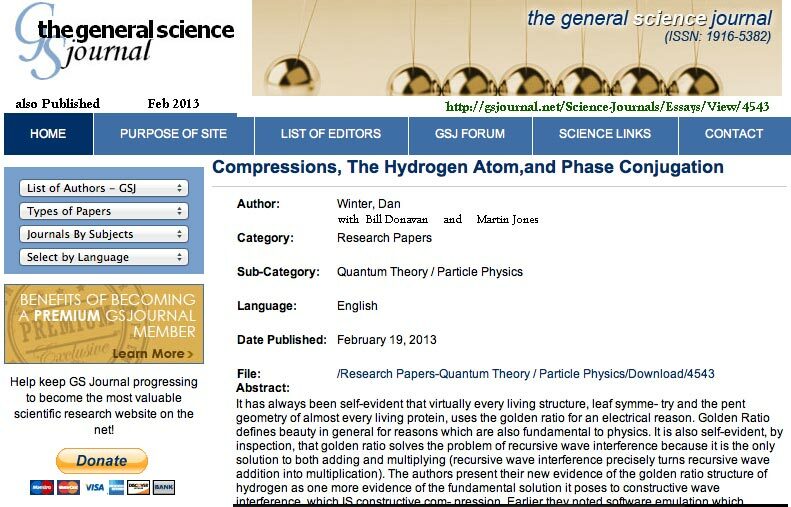 Consider the hydrogen atom as a perfected compression. This gives the lifetime of PERFECTED processes in the atom as finite and assumes that there are nodes where maximum constructive interference occurs: where the nucleic constituents are, and where the electronic constituents are. We must then resolve to find the node that corresponds to the states of hydrogen with which we are familiar. If we set those positions equal to Winter’s radii, then we obtain a formula for the momenta of nodes, corresponding to electronic constituents, for quantum number n of the hydrogen atom. Simply put: perfected compression is perfected phase conjugation. The proof of this reality is quite simple. The phase conjugated solution of the Klein-Gordon equation that we have called a compression has it’s exponent multiplied by − 1. This is the mathematical definition of a phase conjugated wave. Carrying through the negative 1 in the calculations gives all the same results of Equations (12, 13, 14) except the right hand side of those equations is multiplied by negative one. This then opens up the possibilities of negative time and direction. Remember there is a minimum time for perfected interference now in negative time for the phase conjugated perfected compression. So, more precisely, perfected phase conjugation IS perfected compression in negative time and direction. 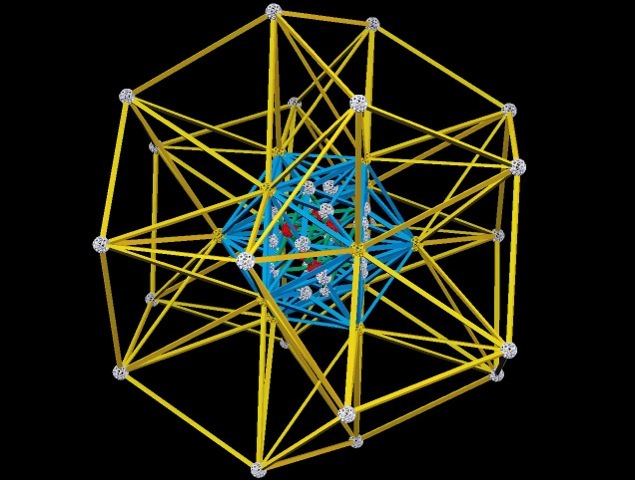 In the future, we may be able to make a more precise relation between physical compressions, mathematical compressions, and even metaphysical compressions, bridging the gap between physics-creating-math and math-creating-physics. For now, it is possible to draw the logical inference that since the Golden Proportion creates the ideal compression with nodes of maximum constructive interference that have a fractal distribution, then the infinite ‘compression’ of symmetry in a fractal also has a mathematical representation as a compression whereby the maximizing ratio for PERFECT fractality is also the Golden Proportion. It has been shown by Winter that the Golden Ratio does in fact show up in fractals such as the Mandelbrot set, so with our analysis we say that those fractals are not PERFECT, but close to perfect, or in other words, those fractals contain nodal points having significant constructive interference. It is intuitively evident that if 2 compressing wave fronts approach each other- the only thing that remains after they have interfered is in fact vorticity/spin. Forming little tornado like vortex structures is clearly the primary occupation of the universe, as it is clearly the root of string and wormhole theory, as well as the notion that every standing wave stored in the universe is essentially toroidal : a donut with 2 vortices. Yet, science often has asked the question: ‘what is the origin of spin?’ without clearly conceiving of a concise answer. Here we suggest explicitly, like constructive wave compression is the result of golden ratio interference, therefore so also is this the origin of spin. The only way constructive interference can in effect store its inertia in the fluid medium of the ether/vacuum is in fact vorticity/ spin. So it is possible to predict the spin of any particle modelled as two merging compressions due to the freedom of the coefficient Cn and Cm which correspond to the coefficient of the zeroth order wave-state in the two compressions. Going back to Winter’s work on color, we are able to interpret the angle θ for two compressions modelling a photon as cube-dodecahedron face angles that correspond to spin of the photon and the different colors associated with those angles that have been discovered. Origin of Color: We further present the symmetry evidence that this phase conjugation by golden ratio is the origin of color at the link fractalfield.com/fractalphotosynthesis. That argument depends on the hypothesis that the octave of wavelengths that are visible can be converted in perfect linearity from zero to 180 degree phase angle, or tilt, of the photon (thought to be a torus). Amazingly, this results in a simple platonic series of angles which emerge ‘magically’ exactly at the wavelength/frequencies of the primary colors. (below) For example, green is a color defined by a photon which has rotated exactly at a cubic 90 degrees. 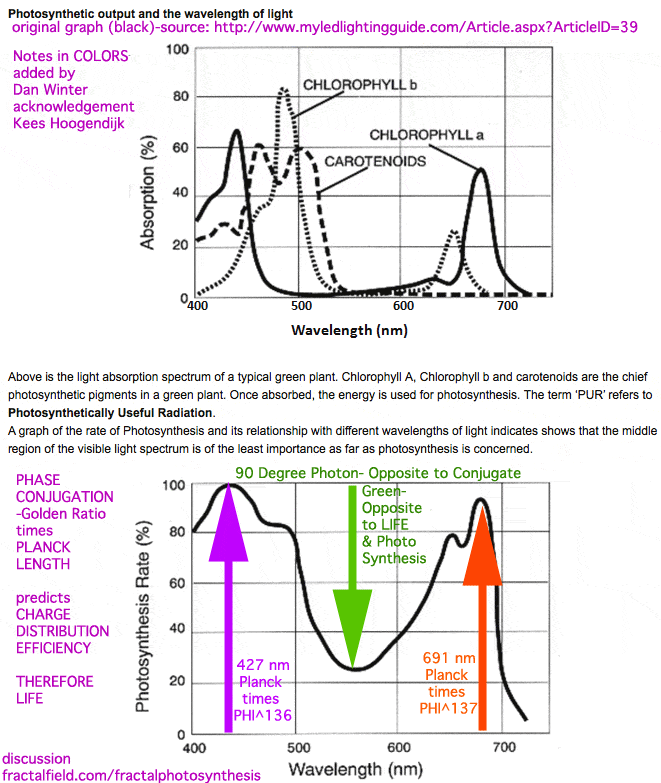 We hypothesize that this angle produces exactly a wave interference ‘shadow’ which is opposite to phase conjugate, and why every living plant (photosynthesis ) spits out / does not eat the green photon (graphic at link). 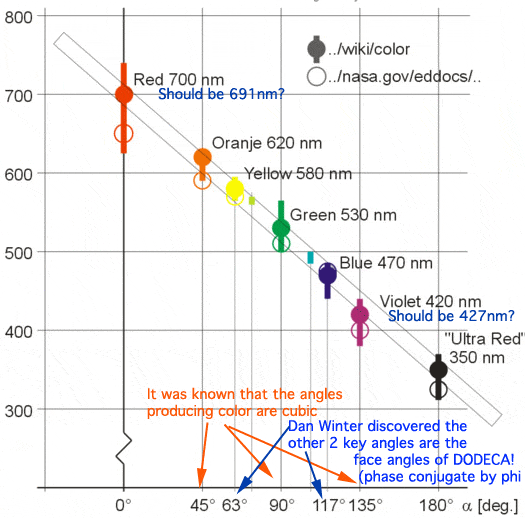 The only 2 photon angles- 63 and 117 degrees tilt or phase angle for Yellow and Blue - which are not cube angles- are in fact the precise face angle to bring the photon into the DODECA face to center. This means that all the angles of the primary colors - photons- are the result of cube / dodec face to center. 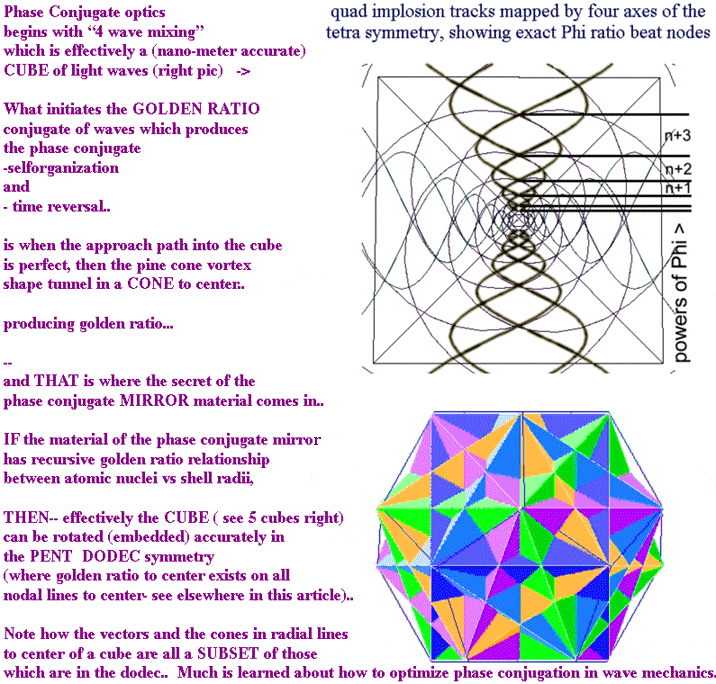 THAT symmetry is precisely what is required to get the photons to phase conjugate by golden ratio. That means that color is the result of golden ratio phase conjugation sorting in the quantum liquid core of the rainbow. (discussion at link above - see- 3 pair of primary colors fit the hex view of dodec/cube). Note how this PHASE CONJUGATION cause and origin of color hypothesis predicts that rainbows are more likely where the air is fractal / conjugate/ charge dense - measurement examples at goldenmean.info/architecture , also would cause the famous Green Flash, - also would explain why the contribution to phase conjugate plasma compression caused when a Tibetan saint dies- causes rainbows. 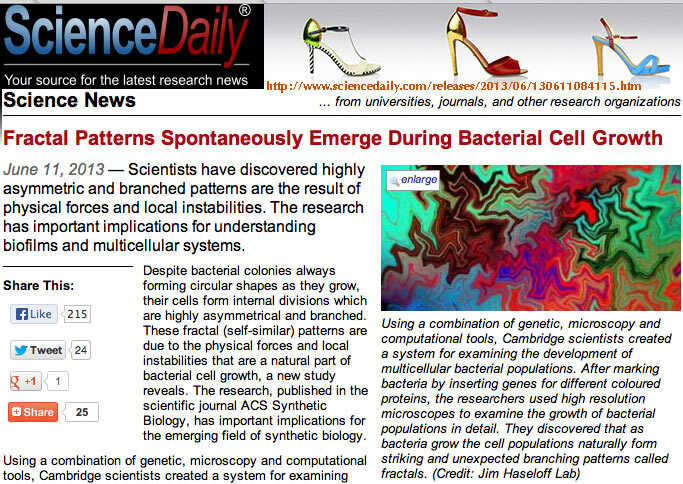 The authors feel strongly that a new form of physics which knows why and how centripetal forces (like fusion, gravity, and life force) are generated with specific electrical symmetry; And that this symmetry is essential to survival in general. 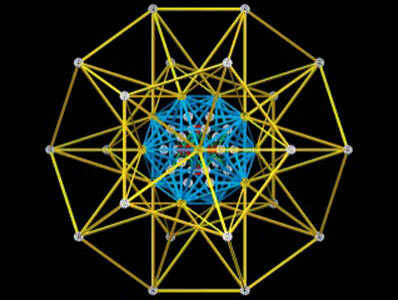 Knowing how the same golden ratio stellated dodeca- symmetry group is the essential wave mechanic of hydrogen, gravity, fusion, life force and perception could in fact go a long way to bringing us to restoring centripetal forces in our planet sphere teetering to the opposite of self-organization, which is chaos. If we know that gravity is stronger when centers of mass and magnetism are arranged dodecahedrally- might we not prevent our highway engineers from cutting major magnetic lines from the planet dodeca- grid once we realize that when fractality bleeds, so also does gravity, and coincidentally our atmosphere! 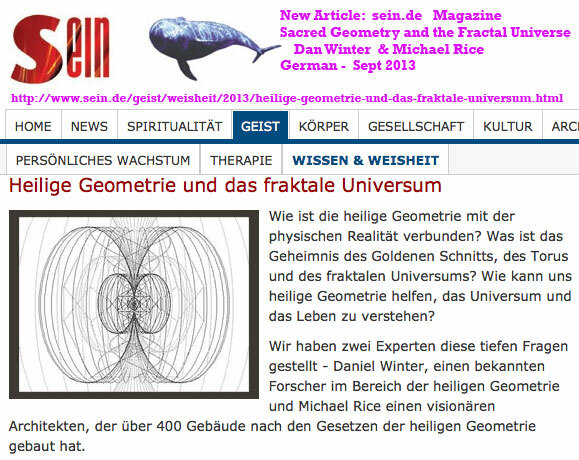 It is no mere coincidence that the exact same dodeca- stellated geometry scaled to planck and golden ratio ( phase conjugate magnetics), in addition to healing planets, also demonstrably reduces pain and accelerates healing in humans. Restoring compression where the fractal bleeds from loss of self-organization is more than a poetic metaphor. It is the only way out of chaos. 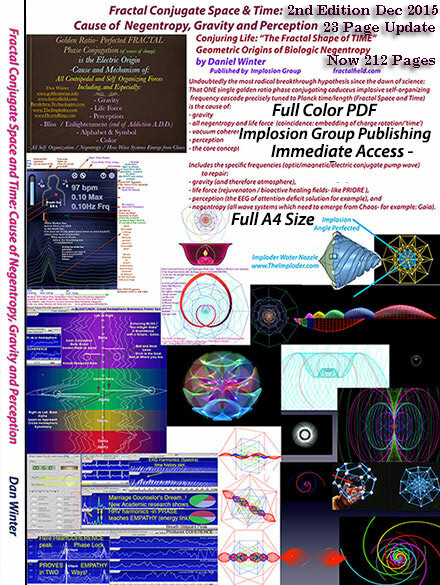 There were many areas within magnetics which require a theoretical update, a more comprehensive unified understanding. For example, the fact that a strong magnetic field effects the gravity of test objects. There is a gravitational component to the magnetic field. Also, magnetic healers have long known that one side of a magnet is more for pain relief (centrifugal) than the other side, which is more healing accelerating (centripetal). In this paper- Bill suggests the centripetal / centrifugal (North vs South) side of a magnet- is charge accelerating- essentially implosion versus explosion dominant. Because- time is that acceleration of charge (charge rotation is our only definition of time) - that means magnetic lines are 'time biased'... and ALSO affect gravity measureably. Bill Donavan’s paper provides the framework in mathematical physics to allow us to develop for bioactive use among other things, centripetal or phase conjugate magnetics, thus, restorative of the implosive compression of charge which identifies healing and self organization. 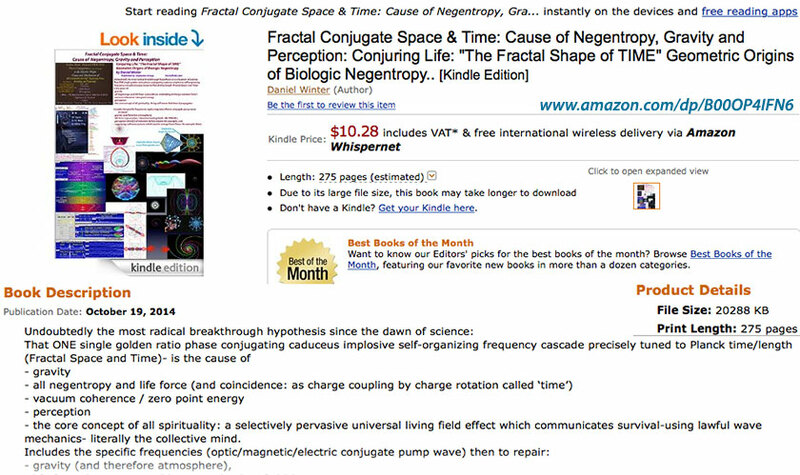 We spoke here of the frequency signature of phase conjugate (restored compression) magnetics, but this also provides the physical framework for us to understand how phase conjugate arrays of permanent magnets restores compression and accelerates healing and growth, and affects time. We have known that there is a high frequency component even to what seems like a DC magnetic flux line. Bill’s new helical model of the braided electric lines which make magnetic flux lines helps us to understand the frequency associated (the width of the helix predicts it frequency). Also, now we can understand that inside itself, a simple magnetic line is an inside-out helix of what is an electric field line! Ultimately, the restoration of centripetal or self-organizing (and phase conjugate) forces in general is going to require a more comprehensive physics of magnetics which predicts implosive (gravity making and bioactive) magnetics. When Bill speaks of negative and positive magnetics as forward and reverse time biased, consider that like all wave fields, they self organize in torus shape. This means that the vortex in one side will generally be more centripetal than the other. This is WHY one side of a magnet is better to heal and reduce bleeding, while the other (centrifugal) side is better to reduce the pain (from a tooth ache for example). 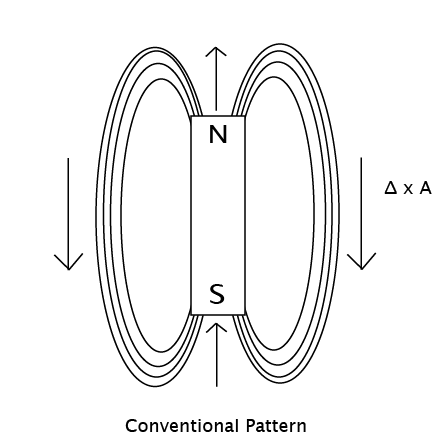 The centripetal side of a magnet (see chart) has a component of its flux lines which phase conjugate. This means that charge compression BECOMES acceleration (gravity) because in conjugate (golden ratio) wave crossings phase velocities can add and multiply constructively (produce acceleration from compression, the cause of gravity and time travel). The component of phase velocity which goes through the speed of light c by multiples of golden ratio is time penetrating. We make the point elsewhere that this precise difference applies to the torus shape of the photon to define the origin of color. The red side is centripetal (Hebrew for red: ATOM, is to MAKE HARD). The blue side is centrifugal. Note the same points we make about phase conjugate being the origin of color applies to magnetics. Compare this to the film here with Tom Bearden explaining how phase conjugate dielectrics heal (http://goldenmean.info/phaseconjugate). The purpose of this appendix is to expand the concept originally put forth in a previous work titled, “In Front of Us” It addresses both the concerns of the CPT invariance as well as the concepts in Tom Beardens talk “The Lost Unified Field Theory of James Clerk Maxwell”. In this form, B is the magnetic field, delta is the change per unit time, and A is the magnetic vector potential. It does not address the issue of the internal torsional component, which is present in the formation of the field, or of the field itself. In Magnetism and its Effects on the Living System , Rawls mentions that the poles of a magnet have differing properties. They are not identical to one another. There is a problem when empirical evidence does not match the mathematical model. When this occurs, the model does not approximate physical reality, and the result is either a lag behind the phenomenology, which is most often the case, or in the extreme, a form of schizophrenia: where the engineers and experimentalists use their own math models and throw out the politically accepted version as non functional. So let us look at a few possibilities that fit the empirical data more closely. Postulate 1 Time is not a direct observable. What this means is that we cannot directly measure time. We measure it in spatial displacement: the hands of a clock, the vibration of cesium atoms or quartz crystals. So therefore if we speak of time reversal, that reversal is measured as spatial reversal: a backing up or reversal of spatial vectors. In this model, the field lines loop back, forming a continuous path around the magnet. This model is what we normally see when you put the magnet under a piece of paper, and sprinkle iron filings on top of it. In fact, this is the only time we see this geometry. When Sparky (Floyd) Sweet placed his magnets on top of a cathode ray tube, he saw a figure 8 pattern. Davis and Rawls also diagram this in their work. Plasma anomalies also show this figure 8 pattern. So which one is right, the filings or the plasma? We have one instance of a continuous loop, and several of this other geometry. In the continuous loop, the delta remains positive through the whole process. In the other words, we have quite a different animal. In this diagram, we have the magnetic vector potential flowing outward in the North pole, interfering with itself. The second A is in continuous flow around each pole. This interference pattern produces the B field. This cross product also produces the B field. So what is missing here? What is the A potential, anyway? Is it real, or a convenient fiction? In a previous paper, I showed that the possibility that the E field is a modulation of the G potential is a real possibility. So what are the possibilities here? Can the magnetic vector potential be a simplified version of a more complex reality? If so, we would have two potentials reacting to one another, one rotational form, and another standing wave form. One would have two sub-forms: one for north, and another for south. Postulate 2 In keeping with the CPT (charge, parity, time) invariance, the negative side of the magnet is the one that promotes increased entropy. The positive pole is the one that decreases local entropy, as it is time reversed in its delta. In “Healing with Magnets”, by Gary Null, pages 8-9, there is confusion between what is north or south, positive or negative. We see this in a great deal of literature. It is quite easy to clear up the confusion. Let the positive side be the one with −∇A, and the negative + ∇A. In quantum mechanics, when one reverses the charge, parity as well as time is also reversed. Therefore, one side of the magnet has a positive time bias, and the other side a negative time bias. One side promotes entropy and growth, and the other neg-entropy and healing. This is seen in the literature. What is the supporting evidence for this? We see in Rawls work, that the poles of a magnet seem to have a torsion field aspect to it. That twist cannot be ignored as it is supported empirically. However, this is only a partial solution, as the other side has a temporal dipole aspect. The alternative is that the opposite pole also has an opposite twist, and therefore would be −∇× (∇× G). This is more elegant, as it preserves the symmetry of the model. The negative delta of the curl G would interact with the negative magnetic vector potential to preserve the negative temporal bias. Postulate 3 Time is the engine that transforms potentials into fields. In a previous paper, “Riding a Beam of Light”, it was shown that all deltas are “frozen out” as one moves at light speed. That means that the E field, which was postulated as ∇G, is now pure longitudinal gravitational potential, a ripple in space-time. The H field vector, which is a motional version of the B field, or magnetic vector of the EM wave, collapses from ∇× A to just a static magnetic vector potential. As speculated earlier, the “A” potential itself may be a composite of gravitational potentials with internal deltas. An alternative key would be to use circular polarization solutions to the magnetic field line and treat it as a standing wave. This means that each line would have a fixed energy, as both the rotational frequency as well as velocity would be equal to C, with fixed wave crests and amplitudes. It could not decrease below a fixed amplitude. The energy would be extremely high, with a large frequency to account for the one-dimensional attribute of the field line. This quantization implies that magnetic monopoles are unnecessary in the model. What this model implies is that the magnetic field line is an artifact, an interference between the torsion field and the magnetic vector potential. Is the magnetic vector potential itself a composite of gravitational potentials with internal deltas? It is an intriguing concept. This concept needs further work and validation. One possible extension of the theory is that as one models the die Broglie wave of a particle, the other half of the wave would exhibit negative time characteristics. The wave would have what would appear to be a negative DC offset, or a positive time bias. The bias could be inversely proportional to mass, so therefore the discrepancy between particle charges and mass could be due to differences in bias. So, for example, since an electron has a mass of +1, and a charge of -1, the wave is nearly all in positive time. The proton, with approximately 1836 times the mass of the electron, but a charge of +1, has most of the mass in negative time. In this case, like an iceberg, most of the mass except for 1/1836 lies in negative time. If this theory is consistent, then the implication is that no Higgs boson is necessary. The mass of the particle depends on the DC offset of the wave function. Neutral particles would be internally conjugate pairs with dynamic infolded engines that sum zero for charge, but exist in positive or negative time, depending on whether it is a particle or antiparticle. One would have to account for the internal structure of the neutral particle. But what about relativistic effects? As the delta G decreases, the charge of the particle would also decrease along with frame rotation. However, instead of a mass increase, we would see an increase in inertia, until at C the mass would be zero and the inertia infinite. This then reconciles the problem with the energy discrepancy of relativistic effects. It becomes a smooth transformation of mass to energy. The surface charge becomes an observed charge vector of the wave in our frame, which is rotated relative to the moving particle. If delta G is zero on the moving wave, then when one “rides” the wave, they see only potentials, and no fields. Furthermore, those potentials are rotated 90 degrees, so from the standpoint of the wave rider, the fundamental character is longitudinal, and not transverse. Postulate 4 Mass movement through time is the result of the DC offset. Is it possible therefore to produce a real “time machine” with this knowledge? If one could duplicate the “DC” bias offset, and reverse it, then there might possibly be a reverse vector in time. Is this how it is done in phase conjugation? In a later paper, we will investigate proofs for this. For now, consider it to be a partly baked concept. But real time travel? David Anderson seemed to think so, and a few years back he invented something called a “time warp field generator”. It produced relativistic effects on the laboratory bench. Not only did it slow down time, it also accelerated it. This phenomenon of temporal acceleration would be expected if one were producing the offset in the other direction. Its the flip side of relativity. For true time travel, one would need to produce offsets that create massive relativistic effects, such that the delta that created the fields in the first place is so low that the potentials are overshadowing the fields. This effectively drives the particles into the Dirac plenum, quenching the fields that produce the illusion of mass. Therefore the effective mass of the particles decreases below the level of detection, and slip into the virtual world. The mass, and the particles that compose it, seem to dematerialize and cease to be part of the observable universe. A.4. Dark Matter – Or is it Phase Conjugate Matter? What happens when large amounts of matter get pushed into the Dirac plenum? The mass is not totally gone, simply minimized. It may be no longer observable, however, it still has influence on the universe if one analyzed it collectively. If one has a trillion parts of something with a distribution of one part per million, then it accumulates to an amplitude of one million parts, and therefore has influence. The point here is that masses can approach an offset that gives it zero mass, but cannot actually get there. There is another possibilitywhat if the die Broglie waves themselves can combine out of phase? If that is true, then one can have “phase conjugate” matter waves. What would this look like? This might be the philosophical premise that J.G. Bennett proposed in the “Regenerative Ratio” as the eternal, matter having equal amounts of positive and negative time. In this case, the E and B fields making up the wave are cancelled, with the negative and positive deltas superimposed. If this is the case, then the internal engines are still active, and producing an influence on the vacuum. This influence, the collective gravitational potential that is not self-canceled may be what we call “dark matter”. What about the model for the photon? In a previous paper, “In Front of Us”, I showed that half of the wave is in positive time, and the other half is in negative time. What this means is that the model for the particle is similar to Sokolows, as he proposes that the photon consists of a virtual particle and antiparticle locked together moving at the speed of light. So what are these particles? Given enough energy, the kinetic energy of the particles should exceed the binding energy, the “glue” holding them together. In astrophysics, there is something called the Chandrasekhar limit. It is the hottest that anything can become in the universe. Beyond this temperature, approximately 6 billion degrees Kelvin, there is observed in the cores of supernovae a sudden burst of neutrinos, with an implosion occurring shortly thereafter. The theory thus far is that shortly after this limit is reached, the core of the star drops from 6 billion degrees to slightly above absolute zero, forming a Bose-Einstein Condensate. It is this state that contributes to the gravitational implosion of the star, and the subsequent thermal spike on the imploding outer layers that cause a sudden fusion reaction, as temperatures and pressures rise to the point where fusion flashover occurs. The neutrino spike, which may be the decay of the photon as it hits the Chandrasekhar limit, may be the proof of the CPT photon. If the neutrino pair is “hooked” together serially, then it becomes a photon. If it is conjugate, with both neutrino wave states in phase spatially, but 180 degrees out of phase temporally, then we would have a wave packet that would give the appearance of a graviton. This would explain the gravity wave spikes that occur coincident with supernova events. What this would amount to is a fraction of the photon decay events producing conjugate pairs of neutrinos. If more than a fraction of the neutrino pairs undergo this conjugation, I predict that we might have an un-nova, where an immense gravity spike causes a gravitational implosion of the star. The star, which by all intents and purposes should go through a supernova blast, just “winks out” of existence becoming a black hole. Video of Sparky Sweets Experiments, courtesy of Ken Macneil. 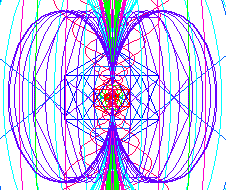 It shows the “figure 8” structure of the field path of the electrons interacting with the magnetic flux. 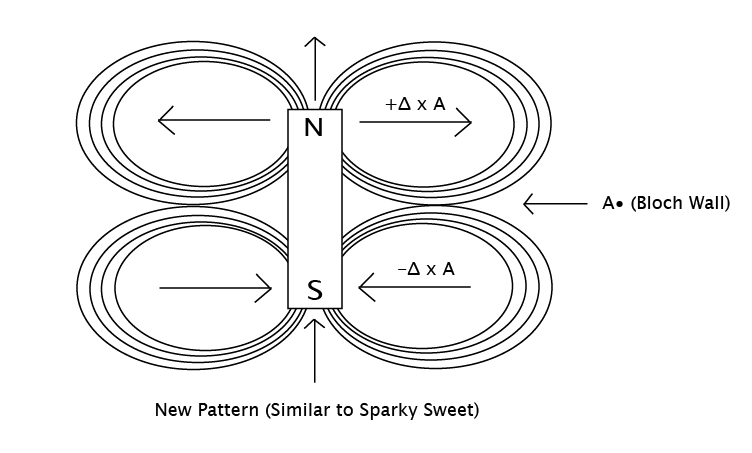 http://www.rexresearch.com/sweet/1nothing.htm Sweets paper on a phase conjugate vacuum triode. Includes some interesting math relations. Healing with Magnets, Gary Null, PhD. Copyright 1998. ISBN: 0-7867-0530-2. See pgs. 8-9. Self-published. This has the original Einstein (gedanken) thought experiment. What it means is that at C, all fields collapse into potentials, their true form without the delta operator. A Dual Ether Universe, Leonid Sokolow, 1977. ISBN 0-682-48721-X. See pgs. 114-115.
 http://www.cosmosmagazine.com/news/2205/looking-stars-vanish-sky This site for Cosmos Magazine has an article that in some computer models, some stars implode without a supernova explosion.